This solid and hardwearing butchers block table from Chabret is rustic and antique in appearance. The hornbeam end grain wood with its small pores will ensure that this butchers block table will be able to handle heavy duty work for many years to come. The end grain wood used for the butchers block is known for its strength and can withstand all blows and knife cuts. When struck it cuts in the direction of the wood fibre meaning that the cutting surface will not be chipped away or broken. 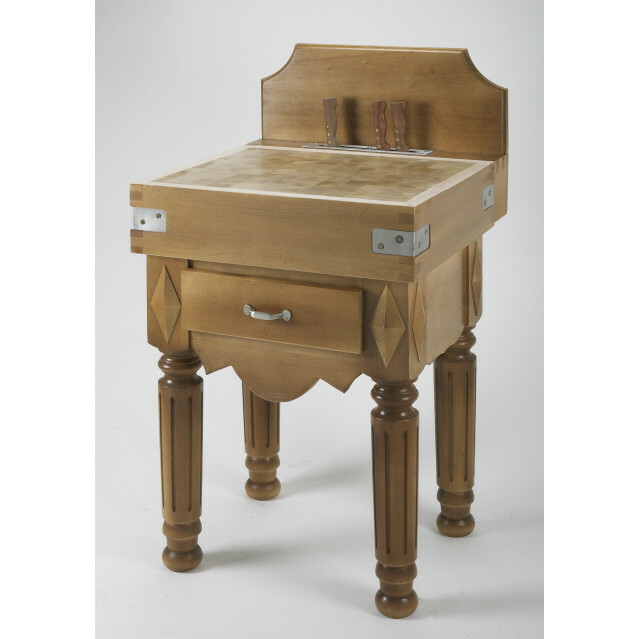 This model has a varnish finish giving it a lovely antique look. Paraffin wax or oil can be used for the butchers block itself. It comes with a knife rest neaty positioned at the back so you can have everything to hand when chopping or preparing food. For a traditional looking butchers block that will stand out in any kitchen, this elegant butchers block is made to impress. The chopping block itself is a good size for all kinds of food preparation. This butchers block table has a drawer for conveniently storing your butchers block utensils. It is manufactured to NF food hygiene standard. The oil coating helps to keep the chopping block smooth and hygienic. This butchers block table is made to order and is of a very high standard. It is manufactured by Chabret in France. Chabret have an in-depth know-how of what makes a good wooden end-grain chopping board and have been making butchers blocks like these since 1885. If you are looking for a traditional rustic butchers block, this could be the one for you.